One of the things that we are really excited about here at Moreno & Young Dental are implant-supported dentures. Many of you know what dentures are and many of you know what dental implants are, but do you understand how we can use the two of them together? It will help to have a small understanding of the pieces and parts involved in implant dentistry before we move on. Key to understanding how this works is to have an understanding of what a dental implant is. 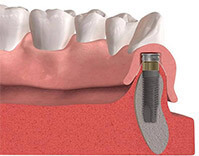 Simply put, an implant replaces a missing tooth root. They are implanted through the gums into the bone. After healing, implants are most commonly topped with porcelain crowns, but there are other things we can put on them, too. This is where the world of implant-supported dentures really opens up. 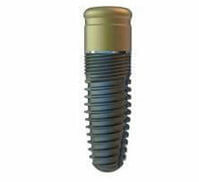 To the left is an image of a “locator” on top of an implant. A good way to understand what a locator does is to think of a snap button. The next image is of a denture connection to a locator. 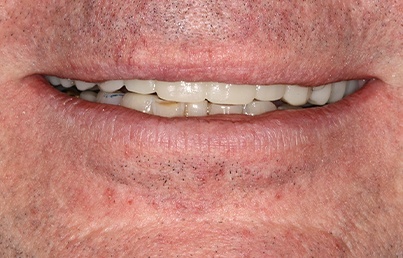 At an absolute minimum, 2 implants with locators can be used to retain a denture. 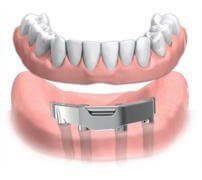 When 4 implants are used with locators, the denture is much more stable. A useful analogy here is to think about legs on a chair. More legs = more stability. 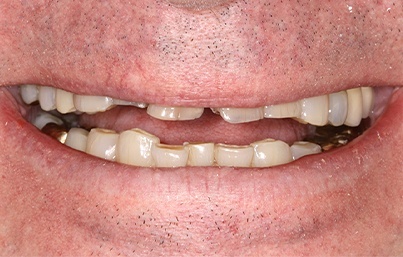 The locator- denture connection strength is tailored to the needs of the patient, and can very easily be changed. This allows us to further customize the denture fit to your needs. Cut-away image of an implant in bone (grey ovoid shape) with a locator. The denture sitting on top of the gums has been converted to accept the locator housing (the other half of the snap button). The housing on top of the locator is what provides the “snap” retention. 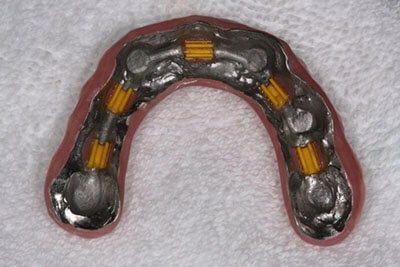 Here is a view of a denture retained by 2 locators. Note; the gums are made to be transparent only to show that there are implants under the locators. Using 4 locators is also possible and provides significantly greater stability. Another attachment we can put on implants is a bar. Bars have the added benefit of even greater stability due to more denture-bar surface interface and there is increasing evidence to support the theory that implants do better when they are splinted together with a bar, instead of operating independently as they do with locators. 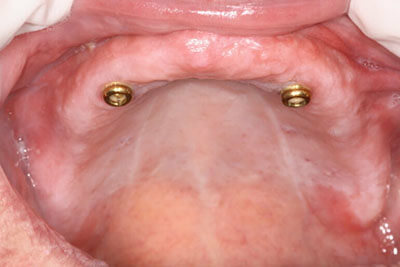 This is an image of a bar splinting 4 implants. The style of this bar is fairly bulky. Today we use much slimmer designs. For most patients, we recommend an implant-supported denture that is removable. However, we also offer fixed options, meaning that the denture affixes permanently to the implants, and can only be removed by a dentist. 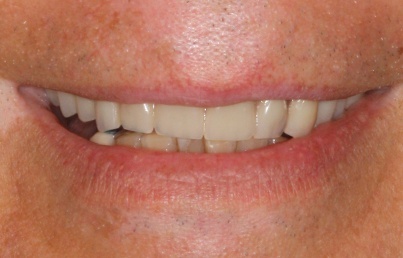 We typically recommend the removable design due to the ability for patients to clean them. As you can see just from this brief tutorial, there are many options and possible combinations in which implants can make dentures more stable. And it’s not just for people who are missing all of their teeth. 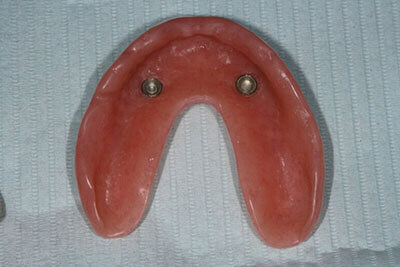 Implants and locators can be used very successfully in making partial dentures more stable. 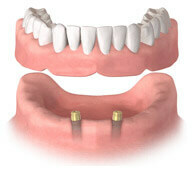 Another benefit to implant retained dentures is the ability to slim down the bulk of the denture. For example, let’s consider an upper denture. Compared with non-implant retained dentures, which get their retention from a suction-cup effect in the palate (roof of the mouth), implant-retained dentures rely on locators or bars for retention and the extra material that covers the palate can be removed. Until you have had your palate covered up, you don’t realize how much that can affect how you taste and speak! When we take a step back and look at the advances that implants have allowed, it really is something remarkable. In healthcare, we commonly refer to something called the ‘standard of care,’ which points to the best possible treatment and the best result. At Moreno and Young Dental, we are a results-driven practice, and we want our patients to not only be happy with the product we deliver to them, but to know that we are doing our best to restore your quality of life as much as is humanly possible. 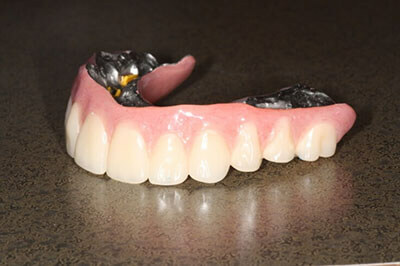 Implant retention on dentures, in one form or another, has become that standard of care. The reason we get so excited about these implant supported dentures is because if you are missing most or all of your teeth, this may be the solution to regaining that quality of life that you once enjoyed. We are always happy to see you for a free consultation to discuss which option is best for your particular case. We will also assist you with your insurance and discuss other payment options. In the folders below, you can look at actual cases. We realize this level of education isn’t for everyone, so it may be best to avoid if looking inside the mouth makes you uncomfortable. You will never be without teeth. 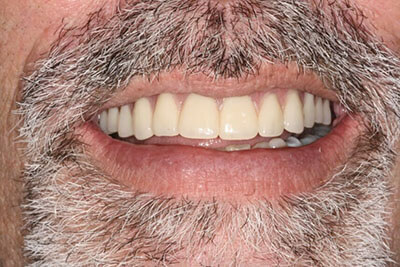 In most cases, we advocate a provisional denture followed by a final denture. The provisional is what you wear immediately after surgery and is worn during the entire healing period. Provisionals can either be removable or fixed. Where possible, fixed provisionals make your journey through this process infinitely more enjoyable. One of the benefits of any provisional (removable or fixed), beyond having the ability to chew and smile, is we get to ‘try out’ a look. We can try a shade and a shape and a character to your teeth that can either be replicated in the final or changed in the final. A procedure like this involves a good amount of oral surgery. Most patients report less pain than one might expect. You will have a supply of pain killers. We all experience pain differently. We will make sure you are comfortable before and after surgery. The largest factor in how much pain you experience is related to the decision to have a fixed provisional or not. Fixed provisional = less pain. Once the pain from the initial surgery subsides, there is rarely an occasion that requires a procedure requiring more pain killers. Standard healing is 4 months but might be longer (up to 6 months) based on observations during surgery. For most cases, the treatment time is the same as healing time. If complications arise, both treatment time and healing time may be lengthened. While time off (usually 1-2 days) is certainly encouraged, you are free to resume whatever level of activity you feel comfortable with in the immediate aftermath of surgery. We will generate a letter to your employer if required. I do request that you eat soft and cold foods for the first 2 months after surgery, so that means avoiding hard or crunchy or tough leathery foods during that time. It’s important to understand risks and complications with any complex surgical procedure. The two most common complications are, first, broken acrylic provisionals (because they don’t have a metal base – final dentures, on the other hand, are made with a metal base) and second, failed implants. When we encounter a failed implant, it may mean a longer time in the provisional phase while we allow the bone to heal and allow the new implant to heal. You will never be charged additionally for procedures stemming from a complication. Here is a picture as the patient presented. 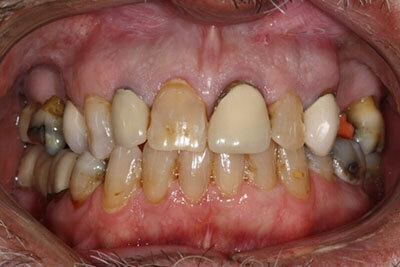 We determined together that it was in his best interest to move to an implant retained bar over-denture. Teeth were removed and implants were placed and a bar was fitted to splint the implants for the upper jaw. Delivery Day! 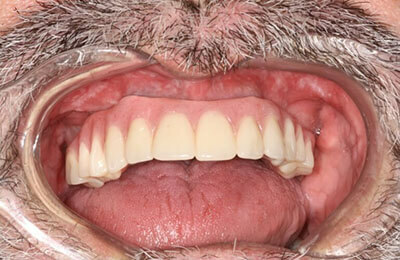 Note the shape of the denture – no coverage on the roof of the mouth. This allows for less speech impairment and allows you to taste foods the same. 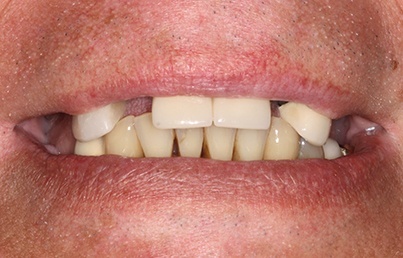 This is what the inside surface of a removable implant retained denture looks like – the side that connects to the bar. This is a retracted lip view meaning we pulled the lip away just to see how it fits against the gums. This was a case where the patient came to me with a full upper plate that she couldn’t get to stay in. We thought we would start with two implants and two locators. When it was time to convert the denture from tissue-supported to implant supported, we were able to cut out the palate (as seen in the image below below). She was thrilled that she got better retention on her denture, and exposed her palate at the same time!